Captain Horatio Hornblower: Screen legend Gregory Peck (“To Kill A Mockingbird“) brings to life C.S. 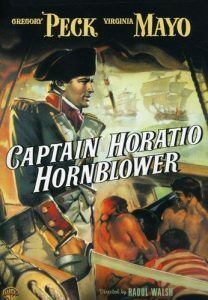 Forester’s classic nautical hero, Horatio Hornblower. Hornblower battles the French and the Spanish forces during the Napoleonic wars. But he also finds time for romance in this spectacle from director Raoul Walsh (“White Heat,” “High Sierra“). Co-starring Virginia Mayo (“The Best Years of Our Lives”). The much-loved novels of C.S. Forester come to life in Captain Horatio Hornblower, a solid, engrossing seafaring tale. Forester himself worked on the script for the 1951 film, which mines its plot from three Hornblower books. Set during the Napoleonic era, the movie kicks off by steering British captain Hornblower (Gregory Peck) into the middle of a nimble cat-and-mouse game with anti-Spanish rebels in the New World–only to find that in the months since he set sail from Old Blighty, national alliances have changed, causing a reversal in his original mission. The action later shifts to Europe, and throughout there is a love story involving a noblewoman (Virginia Mayo) who takes unexpected lodging aboard Hornblower’s ship. The film has an intelligence that keeps it watchable, although it’s definitely not one of the more buoyant films of the robust director Raoul Walsh. Perhaps the movie falls short of classic status because of the casting: its sober nature might stem from the personality of Gregory Peck, who looks marvelous but remains stolid throughout, while Virginia Mayo is, well, Virginia Mayo, a league away from British aristocracy.